So I am a Black Friday fiend. I wanted to share with you guys some of my favorite pieces from scouting the websites. I am sharing this one from Bloomingdales because it is very similar to the dress I wore in my Houston post. A lot of ladies liked it, so you can pick up your own here for only $39.50 original price $88. I actually purchased this one myself from Saks. I really like the bead work on the shoulder. You can pick it up here for $52.49, original price $150.00. Use the code HOLIDAYS and get free shipping. 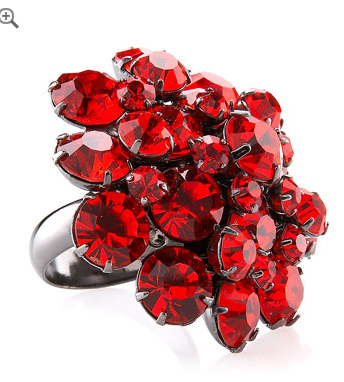 I love this fiery statement ring. Only $39 at Neiman's Last Call. You can find it here. Monif C Swimsuit for only $25!!! at here at Boutique Larrieux. There is also free shipping. This is a great keeper for those winter getaways and the summer. Both pairs of shoes are from NineWest the bootie is $35 after the discount. 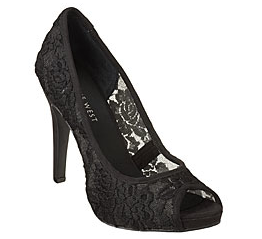 I have been looking for a pair of lace pumps and these may be it. 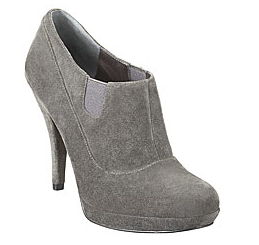 These are $40 at Ninewest and both can be found here. I will be adding great finds throughout the day, so check back. I am sick, so I will be riding the Nyquill train, but I will be getting up randomly to check for deals to add and for stuff to buy. BLACK FRIDAY WOO!!!! Those Nine West shoes are cutee! Good deal too. I need that red ring and those gray booties in my life! I like the swimsuit! I also like Monif C but its quite expensive for me!